I was thinking about banana pancakes with maple syrup, which is a little odd, because I'm really not crazy about pancakes. And when I do eat pancakes, I prefer them with just butter and no syrup at all. But still, the flavor profile was stuck in my head. Sort of like when a song gets stuck in your head, but this was the flavors...bananas in a batter with maple...bananas in a batter with maple...bananas in a batter...and I kept thinking it would be an interesting combination. Maple probably isn't the first thing you think about when you think of bananas, but it's also not something that would seem too horrible, right? I mean, people put maple syrup on top of almost any kind of pancake, even though I'm not one of them. Since pancakes were off the menu for me, and since I happened to have a few bananas that were past their prime, I decided to take those flavors and combine them in a muffin. Please note that this recipe was created and baked at high altitude (about 5000 feet) and they came out perfectly. If you happen to live at sea level and you give them a try, I'd love to know how they came out for you. In a medium bowl, whisk the flour, salt ad baking soda together. Set aside. In another bowl, combine the maple syrup, butter, buttermilk, eggs and banana. Whisk to combine. Add the wet ingredients to the dry and fold until just combined. Fill the muffin cups about 3/4 full. Bake at 350 degrees for about 30 minutes, or until the muffins are lightly browned and spring back when touched. Here, the resulting muffins rose nicely and didn't overrun the cups, collapse, or do anything else annoying, which sometimes is a problem at high altitude. Not bad for a recipe that I threw together on a whim. In a perfect world, the maple flavor would have been stronger. What I ended up with, though, was a really good banana muffin. Not too sweet, moist, really nice for breakfast with a cup of coffee or as a snack. Next time I might cut back on the banana to see if I can get the maple to come through a little more. This was first published in the June, 2009 edition of the Left Hand Valley Courier as part of my regular Vicinity and Beyond series. As I tell people, I’m a city girl. Born and raised in the suburbs of Chicago, wildlife in my childhood neighborhood consisted of pigeons, sparrows and squirrels. Or the baby elephant that escaped from a circus train and wandered through town. But that’s another story. When I was a kid, as far as I knew the only difference between a farm and a zoo was who was more likely to eat who. Which explains why I was snapping pictures of cows and chickens and goats during a recent visit to Windsor Dairy. As far as the reason for the visit to the dairy, it all goes back to a crazy idea I had about making cheese at home. It sounded like an interesting project, but the more I read about it, the more opinions there were about the value of fresh organic milk for cheesemaking as opposed to pasteurized milk. In particular, the antibiotics in non-organic milk can hinder the cheesemaking process, and there’s a difference in texture between cheese made from raw milk and those that have been heated to high temperatures during commercial pasteurization. The problem is that in Colorado, you can’t legally buy or sell raw milk. It’s perfectly legal in other states, and in some areas of the country raw milk is at stores, right next to the big brands. Here, the only way you can have raw milk is if you own a cow, which is a little easier than you might think. Some dairies sell shares of their herds, which gives shareholders a set amount of milk per week, along with access to other raw milk products. It’s perfectly legal, and becoming quite common. Windsor Dairy is one of the local dairies that sells shares, as I found out at the Boulder Farmer’s Market on opening day. So I signed up for a half-share and went to the dairy to see the operation and meet some cows. Besides the organic dairy herd, Windsor Dairy also raises some cattle for meat, and chickens for their eggs. Dairy goats are a relatively new addition to the livestock at the farm. Since there are so few goats right now, the milk will be available first to people who require goat milk for health reasons. The animals at Windsor Dairy seem to be living the good life, compared to the conditions we’ve heard about at factory farms. Here, the chickens roam free once they’ve adjusted to the idea of coming indoors at night (to keep them safe from predators). Even the ones still being trained had quite a bit of space to roam outdoors. The cows weren’t quite as under-foot as the chickens, but they also had plenty of room to roam. The cows are all pasture-raised, when there’s green stuff growing on the ground for them to eat. On the tour, it was explained that it’s not all grass in the fields. Cows like wildflowers and other plants as well, and the dairy plants special mixtures to keep the cows happy and healthy. Part of the dairy tour includes time to watch the milking operation. A little more high-tech than a guy on a three-legged stool, the milking is automated but not completely hands-off. The cows seemed completely oblivious to the whole process. Besides offering a tour of the property, the dairy also has a small store where it sells dairy products, fresh eggs, and meat. While aged cheeses are available to the public, the raw dairy products are only available to people who own a share in the herd. Windsor Dairy offers tours on Friday and Saturday at 3 p.m. or by appointment. The dairy store is open Friday and Saturday from 10 a.m. to 6 p.m. and on Sunday from 1 – 5 p.m. For more information see www.windsordairy.com. This was first published in the December, 2009 edition of the Left Hand Valley Courier. 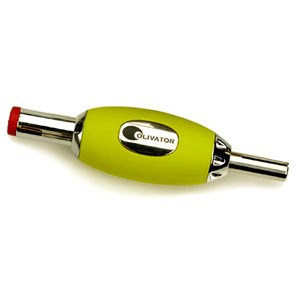 I still remember the look of horror the first time I asked my husband for a kitchen tool for Christmas. He’d heard the stories about husbands who bought vacuum cleaners for their wives and spent the next three months sleeping in the garage. It took a long time to convince him that cooking implements – at least for me – are like new toys. Vacuum cleaners and leaf blowers are still off limits. A basket of flours (yes, I spelled that right) would be an interesting gift for the baker in your life. For the bread baker, King Arthur’s organic bread flour has just been introduced, adding to the ridiculous range of flours they sell. Some are available at the local grocery stores, but if you’re looking for Italian or French-style flours or more unusual grains and blends, you’ll probably need to shop online. If your baker is more interested in the sweet side, how about some unusual pans for cakes, cupcakes and muffins? Nordicware has an amazing array of Bundt pans ranging from the traditional shapes to cottages and sports arenas. For smaller cakes, the Backyard Bug Pan bakes up bugs and butterflies in a pan that’s shaped like a leaf. The underside has decorative veins on the leaf that would make it an interesting decorative piece when it’s not in the oven. Did I mention that Nordicware pans are nonstick and heavy enough to bake evenly? And if you don’t like bugs or Bundt pans, the company makes a huge variety of pans to fit anyone’s personality or party needs. On the savory end, how about a cookbook and some unusual cookware to go with it? Before there was nonstick and before stainless steel, there was clay. While modern metals are a wonderful thing, sometimes you can’t replicate a traditional dish without using a traditional cooking vessel. In Mediterranean Clay Pot Cooking, Paula Wolfert explores the use of a variety of clay pots, and includes both traditional and modern recipes. While it’s unlikely you’ll want to invest in every clay pot mentioned, for most recipes Wolfert gives several options. One of the most common is the Spanish cazuela, a round, straight-sided earthenware vessel that can be used in the oven or on a stovetop. Besides using it for the recipes in this book, it makes a nice serving dish or baking dish for any of your other recipes. The book and a cazuela would be a great combo gift for your adventurous cook. But beware. Not all the recipes in the book recommend a cazuela, so expect to find other earthenware pots on next year’s shopping list. How about a few stocking stuffers? Microplane has a variety of graters and zesters to fill any cook’s stocking. Or is your cook a little clumsy when it comes to grated knuckles? Microplane also makes a cut-proof glove that makes grating a more fearless experience. It’s also great when using a mandoline. Not sure what tools your favorite cook needs? How about unusual spices or spice blends, colored sugars, vanilla and other flavorings, vinegars, olive oils, jams and jellies, or exotic coffees, teas and hot chocolate blends? Avoid the temptation to buy a pre-packaged, shrink-wrapped box at the mall. Instead, shop locally, buy some odd and interesting things, and put it all in an interesting cake pan, basket, serving bowl or baking dish for a unique gift that the cook in your life will love. For a fast holiday nosh, this dip tastes much more complex than you’d guess from its short ingredient list. Take two parts Greek yogurt (I like Fage Total) to one part finely grated cucumber. Drain the liquid from the grated cukes before you add it to the yogurt. Add a tiny bit of grated onion, to taste. For two seven-ounce containers of Fage, start with about a teaspoon of the grated onion and work up from there. Add salt, to taste. Note: This dip can be used immediately, or let it sit in the fridge overnight so the flavors can meld. To make the dip match the theme of other dishes, add herbs or flavorings, as desired. After publication notes: The dip mentioned above was something I whipped up when I was doing a demo of the Microplane box grater. I also served a carrot cake, which went over well, but I was astounded at how many people were amazed at the dip that I served with pita chips. I really didn't think the dip was anything special, but since I got so many requests for the recipe, I figured it was worth publishing in the newspaper. While I usually make my own yogurt, for the demo I didn't want to have to launch into that explanation, so I went with my favorite commercial brand that's now available in most of our local stores. If Fage isn't available where you live, try another Greek-style yogurt, or just strain any plain commercial yogurt through a coffee strainer or a very fine-mesh metal strainer. When you're starting with a thicker yogurt, you can add ingredients that are a little more watery, and still not end up with soup. Personally, I like the Fage Total (the full-fat variety) rather than the 0, 1, or 2 percent versions, but feel free to substitute whichever you prefer. But it seems to me that you're using yogurt in place of what might normally be sour cream, so the full-fat version is already a giant step lower in fat. And then you're adding cutting it by adding cukes. So for a dip, it's pretty healthy, even with the full-fat yogurt. Since publishing this, I've made a few recipes from the Mediterranean Clay Pot Cooking cookbook, and I recently bought a Chinese Sand Pot, which I've tested with plain old rice. Pretty soon, I'm be venturing into some more interesting recipes with that pot. I love carrot cake for so many reasons. It's not too sweet, it's moist, it's filling, and it's not terribly bad for you. However, this carrot cake did not want to pose for photos that would work well in the newspaper where this recipe originally appeared. Not only is newsprint not a great medium for detailed photos, but I never know if the pictures will be in color or black and white. And I don't know what size the photos will be, or how they will be cropped, so I'm never sure how much detail will show up. And carrot cake is decidedly brown. Flecks of orange appear, but it's still a lot of brown. And the more I looked at it, the more I realized that in the newspaper it would probably look like meatloaf. Which is tasty and all, but not when you're writing about carrot cake. When I made a second cake using more whole wheat flour and darker sugars, the cake turned out a deep brown. It was pretty, and the powdered sugar design on top was decorative, but the slices looked like chocolate cake. So trust me when I say that the photos here are both carrot cakes made from this recipe, and they were both absolutely delicious. Not only did I serve it to friends and family, but I also served to strangers at Cayenne Kitchen, where I was doing a demo of a Microplane box grater and cut-proof glove. You probably wouldn’t be surprised to know I have lots of cookbooks. On a lazy day, I might browse through those books for hours, just for fun. I also like books about food. Which comes in handy when someone asks a question about an odd ingredient and I explain the history of it. Yeah, I’m a food geek. So I had to pick up “An Edible History of Humanity” by Tom Standage. It an interesting twist on world history, discussing the role that different foods played in shaping humans and their world – and at the same time, how humans changed the food. What Standage makes clear from the very beginning of the book is that humans starting shaping crops even before they had any idea they were doing so. Early humans modified corn in the Americas so much that in a short time the new plants couldn’t survive in the wild. Humans were required for it to grow. In other parts of the world, rice and wheat were undergoing the same changes. Later, food traveled from continent to continent, shaping politics while politics shaped food. Through wars and shifts in political power, food played some interesting roles. What this book shows, over and over again, is that with each change in food technology, some things get better while others get worse. Early farmers grew crops they needed, but were tied to the land and couldn’t travel as far to hunt. Recently, chemical fertilizers seemed like an answer to feeding the world’s population, but overuse of the fertilizers caused other problems. Now, farmers are looking to other methods to keep us well-fed and healthy. While Standage’s book wasn’t particularly tasty – no recipes to be found – it is food for thought. And when I think about food, I have to cook. Since we’re talking about historical food, an old-fashioned recipe seems appropriate. As an homage to somebody’s grandmother, this recipe relies on ingredients and equipment that grandma would recognize. Terrible photo; great carrot cake. Preheat oven to 350 degrees. Lightly grease and flour a Bundt (or similar) pan or use that newfangled baking spray, if you’re feeling modern. Mix the flour, cinnamon, baking soda and salt together and set aside. Beat the oil and eggs until they are light. An electric mixer would be handy for this, but feel free to use a whisk or an egg beater. Beat in the sugar a little at a time. Gently add the dry ingredients to the wet, then fold in the carrots. Pour the batter into the pan and bake for 45-55 minutes, or until a toothpick comes out clean. Cream cheese icing is traditional on carrot cake, but this is tasty plain. A decorative dusting of powdered sugar is nice. Grate the carrots any way you choose. Coarser carrots will be more visible. Or grate in zucchini or apples to make up for the fact that you only have 2 cups of grated carrots and you don’t want to go shopping. You can substitute white flour or white whole wheat flour, if you prefer. This was originally published in the March, 2006, edition of the Left Hand Valley Courier, as part of my regular column series, Vicinity And Beyond. If Hayes isn’t around, ranch hand Ray Cook is ready and willing to explain the ins and outs of bison ranching. Yes, this isn’t a cattle ranch; it’s a home where buffalo roam. If no one is around to greet visitors, there’s a bell outside as well as instructions as to where to look if no one appears. Before we go any further, it’s time to clarify the bison/buffalo thing. The critters that live in America are scientifically known as bison, but we’ve been calling them buffalo for so long that the name has stuck. The animals that scientists call buffalos live only in Africa and Asia. But I’m staying true to the song. As far as I’m concerned, you’ll find roaming buffalo at Spomer Ranch. Well, not exactly roaming. Buffalo aren’t the friendliest of animals and can cop quite the attitude when they imagine they’ve been provoked. On a recent visit to the ranch, Cook wanted to move some buffalo out of the way so we could see Dazzle, a tiny baby buffalo. One of the adult buffalo didn’t like the idea, and put on quite the show. Placid buffalo are one thing, but when one of them lowers its head, paws the ground and snorts, it’s a pretty impressive warning. Yet, another buffalo was so tame, it came up to the fence and allowed me to be petted. Cook cautioned that letting the buffalo lick you could be a little unpleasant. “It’s like a cat’s tongue,” he said. Spomer Ranch raises buffalo, and boards them for other people, with an average of about 100 buffalo on the ranch most of the time. They also board horses and grow alfalfa and grass. Another part of the operation is Red Barn Bison company, which sells bison products including meat, hides, heads and anything else usable. To keep up with the demand for buffalo products, Hayes contracts with other ranches to raise buffalo for him. While ground buffalo is readily available in area grocery stores, other cuts are harder to find. Red Barn has them all, from ground to stew to steak to roasts to sausages to the puzzling packages marked RMO, which I found out were Rocky Mountain oysters. Besides buffalo meat, I found some ground yak and some elk meat in one of Red Barn’s freezers, all available for purchase. Cook pointed out that buffalo is a lot leaner than most meats, and that he lost a lot of weight, about 60 pounds, by eating buffalo. USDA information confirms it: for 100 grams of cooked lean meat, buffalo has 2.42 grams of fat, while skinless chicken has 7.41 grams, beef has 9.3 grams and pork has 10.5 grams. Buffalo is also lower in calories and cholesterol. The meat is so lean that you’ll usually need to add some fat when you cook it. Brown some ground beef and you’ll be draining fat from it. Cook some ground buff from Red Barn, and you’ll need to add a little fat to brown it, and you won’t have anything to drain. And according to the ground bison packaging, it’s “the original red meat.” Who can argue with that? Spomer Ranch is at 23675 WCR 27 ½ in Milliken, Colorado. The Wild Side is at 220 Main in Windsor, Colorado. Semolina flour is what's used in some pastas, but I really like the flavor and texture that it gives to breads. Ever since I discovered this little trick, I've been adding semolina to a lot of different bread recipes. If I'm ordering other things from the King Arthur Flour website, I usually stock up on their semolina. Locally, I buy Bob's Red Mill semolina which is available at the supermarkets. Today seemed like a good day to bake bread, so I starting throwing things into the bowl of the Kitchenaid stand mixer. Okay, this requires some explaining. The whey was left over from yogurt making. I strain it because I like a thick yogurt, and I keep the whey for making bread. The honey crystals are dried honey that I picked up at an Asian market. I'd never seen them before, so I had to buy. The scoops of semolina are because a keep a scoop in the container and I wasn't in the mood for measuring. Imagine it was about a half-cup or so. I mixed that with the paddle attachment until it was cohesive, then put in the dough hook and let it do its thing. It was a little stiffer than I wanted, so I rehydrated some dried potato buds in some tepid water -- maybe a half-cup -- and tossed that into the mix. I like to put mashed potatoes or dried potatoes into breads, sometimes, because it makes the bread nice and soft. At about the time I had the buds mixed with water, I remembered I had scoops of leftover mashed potatoes in the freezer. Oh well. Silly me. When the dough was shiny and stretchy, I added olive oil, a tablespoon or so, and let that incorporate, then covered it the bowl with plastic wrap and wandered off to do other things. When I got back, it was well over twice the size. I floured the counter and got the dough out of the bowl and gently shaped it without doing a lot of extra kneading. The dough was very supple and soft. Not sticky-soft, but squishy-soft. Sprinkled cornmeal on a cookie sheet, put the bread on the sheet, and wandered away. When I came back, the bread was just about perfect. Uncovered it and got distracted again. Came back, sprayed the loaf with a baking-shine spray that I got from King Arthur Flour's website. It makes the bread shiny and helps things stick to the dough. Then I sprinkled it with sesame seeds, slashed it, and put it in the oven. At this point, it had risen about as much as I could expect, so I figured I wasn't going to get a whole lot of oven spring, but the slashes did widen a bit in the baking. And the sesame seeds clung tight. The finished loaf was quite pretty, but I forgot to take a photo right away. At least I remember before we'd eaten it all. Oh well. It's tasty. Okay, not exactly "now," because I finally finished it over the holidays. And yes, I'm late to the party, because the book has been out for a long time. So shoot me. 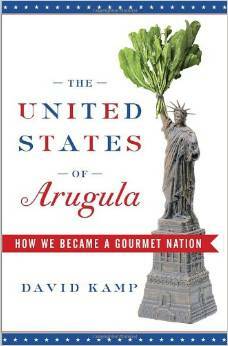 Anyway, The United States of Arugula by David Kamp was the last book I finished, and it was not at all what I expected. I picked it up, cheap, at a used bookstore (or should that be a used-book store? whatever.) and bought it just because I knew it was a quite popular book about food. Hey, if a title like that is in the paperback rack for fifty cents, it's hard to refuse. After recently reading one of Michael Pollen's books, I was sort of expecting more of the same - nutrition, factory farming, the history of various foodstuffs - but instead, this was more about the people of food. The introduction starts with a 1939 quote from Clementine Paddleford, a woman I'd never heard of, but am now intrigued by. And of course it chronicles the writers and restaurant owners and critics and the different food movements that were spawned because of (or in spite of) those people. My downfall, in reading this book, was that it mentioned so many other books, mostly cookbooks. And I have a really, really bad cookbook habit. When I stumbled upon a Clementine Paddleford cookbook, of course I had to snag it. Before, I probably wouldn't have given it a second thought, but now this was part of history. In many cases, though, I already had the books mentioned, or at least I had books by those authors. The other good news is that used cookbooks are usually fairly cheap, so my shelf space may suffer more than my wallet. In some cases, though, the book helped me winnow thought the "find one of these days" list I had of old cookbooks by past luminaries of the cooking world. Some of those cookbook authors were quite prolific, but that doesn't mean all the books are gems. While I don't mind having a few titles by the same person, if I'm going to have to choose from among a dozen titles, I'd rather know which one or two were the best of the bunch. In particular, Kamp sorted through James Beard's many cookbooks, noting which were true classics and which were less inspired. While I'd heard of many of the people Kamp talked about, it was in isolation. 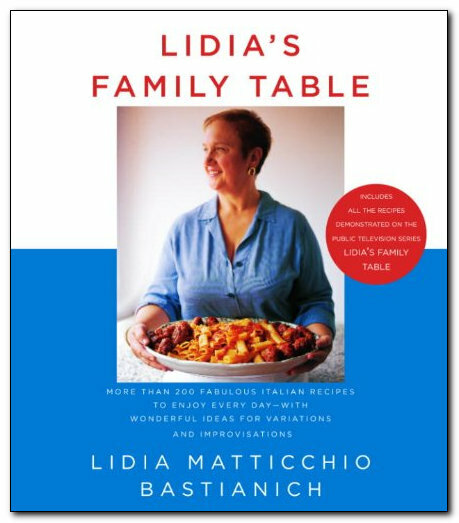 Julia Child was the French Chef and James Beard was that cooking guy, and Alice Waters was, well, Alice Waters. And Escoffier was ... somebody important. But this book managed to tie them all together in a way that makes sense. And it makes the food trends make more sense, too. No, I'm not thirsty. It's the title of a book. For Christmas, I got the new pasta extruder attachment for my Kitchenaid stand mixer. The first thing I decided to try was the rotini. Just look at all of 'em! Aren't they lovely? Coffee aficionados will tell you that fresh coffee is best. Drink the coffee right after it’s brewed, brew it quickly after grinding and grind it soon after roasting. Luckily for those of us near Vicinity, fresh coffee is nearby. Drive east of Main on 9th Ave. in Longmont, and you might smell the aroma of coffee. The scent is certainly appealing, but the origin is a little mysterious. A little investigation reveals that tucked in a warehouse along the tracks is the Unseen Bean, Longmont’s own coffee roaster. The tagline “Blind Roasted Coffee” is also a mystery until you realize that master roaster Gerry Leary, is blind. Leary was blind from birth, but that didn’t slow him down. He was working as an auto mechanic when he happened upon a San Francisco restaurant that roasted its own coffee. He was intrigued. No one would take Leary on as a coffee roasting apprentice, so he went to seminars. His first roasting machine would handle only a quarter-pound of coffee at a time. Leary’s first big order was for 90 pounds of coffee. It took him three weeks to roast that many beans. When he got paid for the beans, he thought, “That’ll buy me some more coffee.” He hasn’t stopped since. Leary still has the small roaster, along with a larger machine that can handle 25 pounds of beans at a time. The roaster turns the beans constantly, something like a cement mixer. During the roast, the beans go through two “cracks” where they sound like popcorn popping. It’s a fast process that has to be closely monitored. Cathy Miller, Leary’s long-time friend, works with him at the Unseen Bean. “I’m the ‘sight’ manager,” she said with a laugh. But Leary has everything organized so he can work without help. He pointed out Braille labels on the bins of green coffee. He has voice readers for his roaster’s thermometer, his computer and the scales for weighing the coffee. For getting around Vicinity (and beyond) he has a voice GPS. Miller and Leary agree that it’s a great business to be in. Miller said, “It’s like being on a coffee break all day.” Indeed, with every batch that’s roasted, Leary grinds some beans and brews a pot of coffee for a taste test. That’s fresh coffee. That’s not the only benefit. Leary said, “The nice thing is that this is a business where people smile when they pay.” He explained that as a mechanic, he knew people weren’t happy when they spent money on repairs, but they enjoy buying good coffee. Have you ever noticed the round devices on the front of whole-bean coffee bags? Leary explained that those are one-way valves that let air out of the bags, but don’t let it back in. Freshly roasted coffee beans give off gas, and if those valves weren’t there, the bags might burst. Once coffee beans are stale, they quit giving off gas. Makes you think about those cans of ground coffee, doesn’t it? Leary said, “We’re more expensive,” noting the cost of the raw beans. But his website invites, “taste the passion in blind-roasted coffee,” and he’s serious about that passion. Since I wrote this article, the Unseen Bean has expanded its operation and now has a coffeeshop in Boulder, Colorado, and sells beans at a variety of locations. You can also order online at http://www.theunseenbean.com/. This was an interesting article for write, for a variety of reasons. For one thing, Leary is so comfortable with his blindness and is so aware of his surroundings that I kept forgetting that he couldn't see, and I ended up becoming a hazard for him as he worked. At one point while trying to take a creative photo, I caused him to spill some green beans into finished beans, which then had to be sorted. He was quite forgiving about it, but I insisted on getting the beans sorted so he didn't lose the whole batch because of me. Also, Leary samples each batch of coffee after he roasts it, and during the course of watching him roast several batches, I sampled right along with him. He brews a strong pot of coffee. I'd already had a cup or two that morning before I left the house, but I couldn't resist that incredibly fresh coffee. By the time I left his shop, I had a bit of a caffeine buzz going. Looking for egg foo yung? This is one of my very early, stream-of-consciousness recipes. If you're looking for more precision, I have more egg foo yung here and here. Or, continue reading for my first foo. Today started with me knowing that I'd have to do a little work today, but a quick scan of email held the good news that I'd won a prize from my favorite cooking-related website, Serious Eats. So that cheered me up a bit. And it's always a good day when I'm planning on baking a loaf of bread. I don't know what it is about bread, but it makes me happy to see it change so many times during the mixing, rising and baking. Better yet, I didn't need to worry about getting the loaf done and cooled in time for dinner, so there was plenty of time for leisurely rising. When the dough came out of the bowl after the second rise, it smelled wonderful, and I was glad I gave it the extra time. On the other hand, the yogurt that I had prepped the night before hadn't set up. After the fact, I realized that the last time I bought milk from the local dairy, I had yogurt-making problems. So I gave it another shot of culture and let it sit some more. I don't think it's any better, and I'm not sure what I'm going to do with a half-gallon of liquid yogurt. I suppose I can bake with it, but that's a lot of yogurt to use up. And meanwhile, I still have no fresh yogurt. I had a little errand-running to do, and stopped in at my favorite store in town, a kitchen supply place called Cayenne Kitchen. If I ever lose my mind and wander around town lost, that's probably where they'll find me, ogling the gadgets or the bakeware. Dinner tonight was egg foo yung, from a recipe I got from an adult-ed cooking class about a thousand years ago. Or it seems that long. 1 can (of unknown size) bean sprouts. Sigh. Bean sprouts come in 2 different sized cans. This recipe didn't specify. I think they wanted the larger, and I had the smaller, so I ended up adding extra veg and more flour (see below) to make up it work. And if I had been able to buy fresh sprouts or I thought far enough ahead to sprout my own, I would have done that. But no, I had canned bean sprouts and canned chop suey veg. I had leftover char sui pork, so that what went in there. I used more than a half cup, though. Considering this was way back in the stone age, Accent (monosodium glutamate) was suggested, along with soy and/or salt. Since the pork was pretty well seasoned, I didn't add anything else. Recipe says to mix the ingredients, sprinkle on about a tablespoon of flour and fry in a frying pan with a tablespoon or so of oil. Well, the flour wasn't enough to make the egg mixture less soupy, so I added the extra veg and some flour until it looked like it would behave properly in a frying pan. Recipe also says to use stock thickened with cornstarch to make a sauce. Nuh uh. You need soy in the sauce, too, to make it like the takeout stuff. So I used the liquid still left from the char sui, and added soy and cornstarch. The Egg Foo Yung was pretty darned good. I might make some more tomorrow, since there's still some pork left over, and I made plenty of rice to go with.